A lesser known trail which is tucked away in a Welsh forest near Machynlleth. 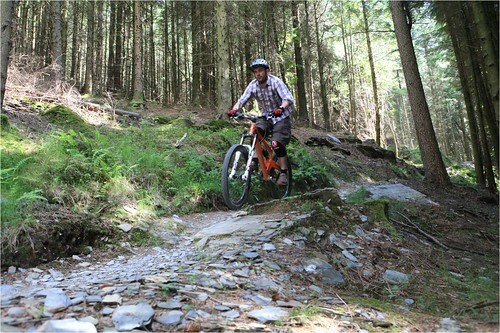 Can it hold its own against the mighty trails at nearby Coed y Brenin? 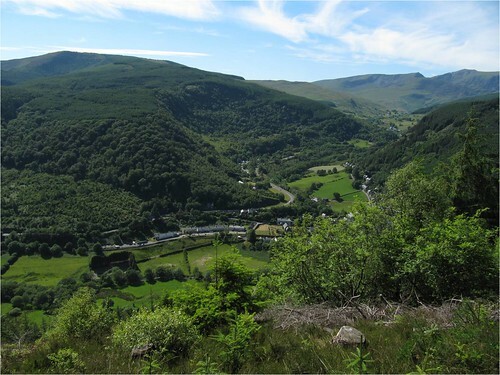 ClimachX is the only dedicated waymarked trail at the Machynlleth trail base, the others, Mach 1,2 and 3 being natural bridleway trails. 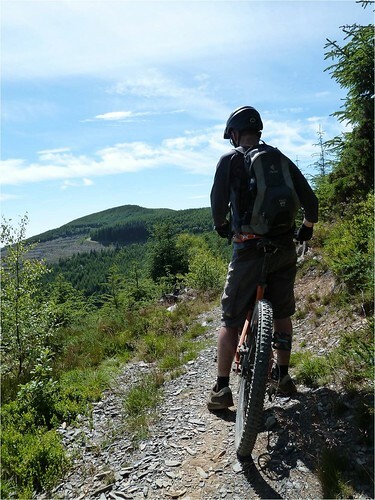 Located in the scenic Dyfi Forest just north of the town, the trail boasts the longest downhill in Wales. All of the information on this trail tells you to start from the centre of Machynlleth and then ride a cycle route 4 miles to the start. We got some local knowledge from the Holey Trail bike shop and just parked in the trail’s carpark instead!! It’s not very well sign posted but its better then trekking all the way over from Machynlleth. Once there you realise that this trail is aging and doesn’t feel as well trodden as Coed y Brenin. The waymarks are faded and sometimes hidden a little behind foliage. The trail itself is OK, it doesn’t have the best flow and there are a fair few long forest road sections between the singletrack sections. However when the trail opens out you get some stunning views over the valley. Overall the majority of the red graded trail is very pedally and takes its time to get going. Once past the red sections though you soon forget about all that proceeds when you get to the final downhill section! You can tell when you are approaching it as the trail get stupidly technical over some big rock features and then you pass a large wooden berm on your left as you merge with the shortcut that allows you to session the final descent. The final descent starts with a couple of short narrow pieces of northshore before you launch down a short rock garden into main event. 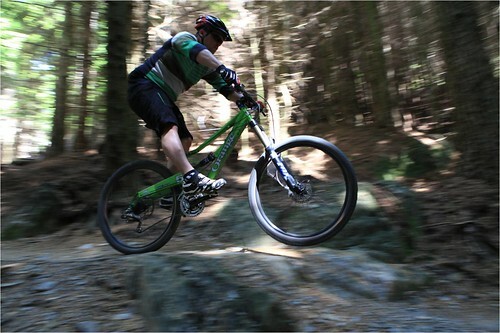 The trail is littered with well placed jumps and rocks which allow you to carry a constant speed and really push on. It’s one of those descents that the more you ride it the faster you get. It’s not massively technical so once you gain some confidence and familiarity you can just let rip and ride on the limit, just watch out for the dodgy left hand hairpin towards the final berms, the big wooden arrow is easy to miss! The descent finishes with a series of berms which flow sublimely into one another before spitting you out onto a forest road and back towards the car park. At which point just ride straight past your car and back up the trail towards the shortcut that will lead you back to the final descent for another rollercoaster ride back to the bottom. So in summary, if you can find this trail it’s well worth riding! 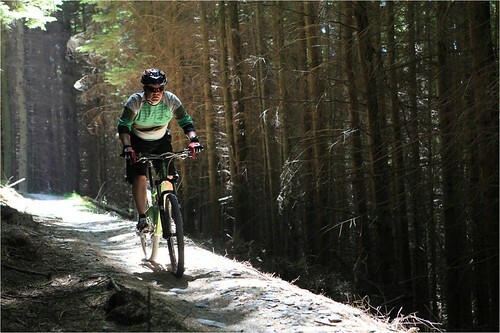 Use the main trail as a way of warming up for the final descent and then just session the downhill until satisfied! We spent two days up there which I think sums it up! "We spent two days up there..." - That must be some DH section! Cli-MachX - about to be ticked off next week!